I was a horrible wrestler in high school. During my first year as a wrestler, I got pinned every single match. I went out for wrestling because I was too little to play football or basketball and I really wanted a varsity letter jacket to impress the girls. Wrestling was hard. I had to lose a lot of weight during wrestling, because my only chance for making the varsity team was to wrestle in the 105 lb. weight class. The 98 lb. and 112 lb. varsity wrestlers were both State finalist wrestlers, and there was no way in the world that I was going to take their spot on the team. So I starved myself, dehydrated myself, and worked really, really hard to get that 105 lb. spot on the varsity team. I don’t know what happened next, but I must have gotten really, really pissed. In what can only be described as a miracle, I was able to break free from my opponent’s grip and I got on top of him. As time was running out in our match, I got him in a move and pinned him. There was a moment of silence, and then my teammates and coaches started jumping up and down with delight. My opponent had tears of embarrassment in his eyes as we shook hands and the end of our match. The “fish” had beaten a champion. When the event was over, our head coach went through each of the matches as we stood around him in the locker room. I may have pulled off a miracle win but the team lost the the meet. He gave each wrestler a word encouragement or correction, starting with the 98 lb. weight class all the way up to Heavyweight. Initially I was sad that the coach skipped over me, until at the very end of his speech, with tears of pride in his eyes, he said, “We all know that Lenny is not one of the best wrestlers on our team, but if you all would have wrestled with his heart we would have won today.” Receiving my coach’s blessing that day was the most memorable moment of my wrestling career. 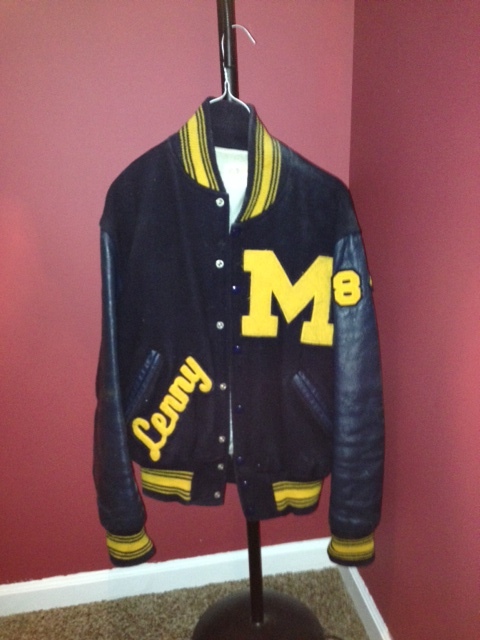 I got my varsity letter jacket that year and I wore it proudly. My coach said that I had earned it. There was a man in the Bible that wrestled with all of his heart too. His name was Jacob. Jacob wanted God’s blessing more than anything else in life and was willing to lie, cheat and steal to get it. In Hebrew, the name Jacob means, “He grasps the heel.” Jacob was a fraternal twin and was named “he grasps the heel” because his brother, Esau, beat him out of the womb to become the firstborn. Esau was a man’s man and his father’s favorite. Jacob was a momma’s boy. These boys started wrestling in the womb to see who would get out first and Esau won. In Jewish culture the firstborn boy received the greatest blessing from his father. Esau was bigger and stronger than Jacob even as a baby and he beat Jacob out of the womb to become the firstborn son. But what Jacob lacked in size, he made up for in cunning. Jacob schemed with his mother to trick his old blind father to bless him instead of Esau. Jacob pretended to be Esau and stole the firstborn blessing from his stronger brother. But stealing his earthly father’s blessing was not enough for Jacob. He wanted God’s blessing too. He wanted it so badly that he was willing to wrestle God to get it (Genesis 32:22-32). Jacob was stressed out because he was returning to his home country and his brother Esau was on his way with four hundred men to meet him. Jacob was afraid that his brother was going to take vengeance on him and his family for stealing their father’s firstborn blessing from him. So one night, as Jacob stressed over the pounding he was about to receive from his brother, God came to him in the form of a man. Jacob recognized that this mysterious man was God and he wrestled with God all night long. The Bible says that Jacob was so determined, that this heavenly man could not overpower him. Jacob told his heavenly visitor, “I will not let you go unless you bless me,” and believe it or not, God honored Jacob’s request. God said, “Your name will no longer be Jacob, but Israel, because you have struggled with God and with men and have overcome.” To prove to Jacob that his wrestling match with God was not a dream, God touched his hip socket, which caused Jacob to limp the rest of his life. I think that we can all learn something from Jacob. Do you want your father’s blessing on your life so badly that you would be willing to lie, cheat and steal to get it? Do you want God’s blessing on your life so badly that you would be willing to wrestle with God and hold onto Him until He gave it to you? You would think that God would punish Jacob for being a scoundrel, and for his arrogance in thinking that he could wrestle with God and win. Jacob may have been a momma’s boy, but he was no fish. He was a man full of heart on a mission. He was a man who knew that the most important thing that a man can have in his life is God’s blessing. God may have been displeased at Jacob’s dishonesty, but He was pleased with Jacob’s heart. God rewarded Jacob with something way better than a varsity letter jacket. He rewarded Jacob with a new name, a limp and a legacy that will last for eternity. Are you ready to rumble? God is waiting. But be warned… you will likely come out of your wrestling match with God with a limp, a new name, and an awesome mission from God. Great article Len – What an encouraging story and application!